Private Eyes Optometry is located at 3612 East Chapman Avenue in Orange. The eye health care professionals specialize in comprehensive digital eye exams, corneal reshaping therapy and laser vision correction. In addition to the services offered, this optometrist also carries attractive eyewear models. 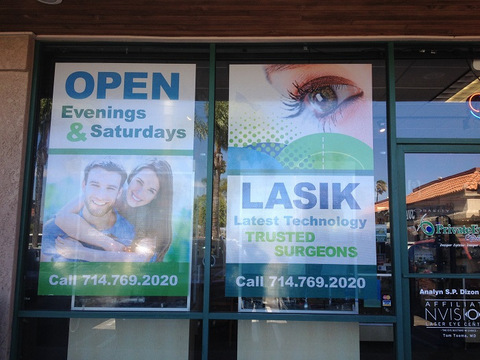 When it came time to add the types of vinyl window graphics Orange, CA, health care providers commission, Superior Signs and Graphics got the call. Perforated window graphics that advertise! Fabricating and Installing "See-Through" Window Graphics! 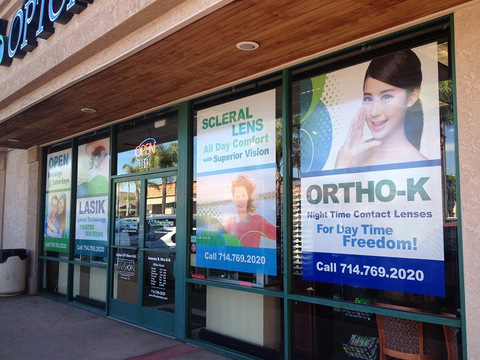 We met with the optometrist’s management team and discussed the installation of four perforated vinyl window graphics. They are six feet tall by 53 inches wide. These graphics introduce consumers and patients to the additional services that Private Eyes Optometry specializes in. Examples include scleral lenses and nighttime contact lenses. 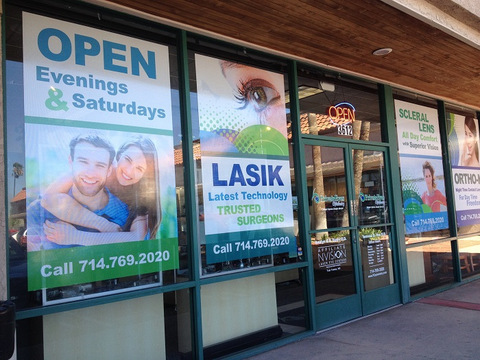 Leaving the bottom thirds of the windows uncovered, the graphics attractively market the services while relying on the colors that consumers already know from the optometrist’s website. Have you been thinking of adding see-through window graphics? Orange, CA, retailers and service providers know that this is an excellent marketing tool that expertly ties together various advertising products. Restaurants. Whether you run a pizza restaurant, a breakfast hot spot or a diner, choose window graphics to display some of your tastiest dishes. The high-quality digital displays of the food bring in hungry guests. If you are expanding your menu to include other foods as well, this is a great time to dedicate one glass pane to the new meal selection. 95% of people surveyed remembered the graphics they saw! Retailers. It does not matter if you sell antiques, furniture, consumer goods or pet supplies. Window graphics eliminate the look of unsightly storage areas behind your shelves and instead mask them with the vinyl advertising that brings your message to the consumer. Highlight your products, advertise special discounts and do not forget to make good use of these perforated window graphics for the seasonal sales that are just around the corner. Service providers. In these settings, the graphics fulfill two distinct functions: marketing and privacy assurance. Although there is not really a legal need for privacy when visiting a spa, optometrist or dentist, clients do feel more comfortable if they are not on display via the large windowpanes. At the same time, the storefront is perfectly illuminated with the natural light that comes through the glass. Window perfs are therefore the ideal product; they allow the light to come through but keep curious eyes at bay. Your images easily transformed, printed and installed! Pair your see-though vinyl window graphics with door lettering, interior posters, floor graphics and A-frames that go on the outside of the storefront. We consider these one-two advertising punches that capture the attention of the consumer and then redirect it to the message that you want to get across. Call our signage experts today for more information on window graphics and secondary marketing solutions that present your products or services to their fullest advantage. We gladly come out for a site survey, take measurements and take in the atmosphere of the neighborhood, which helps us to provide you expert advice with respect to the type of signage that will stand out in all the right ways.